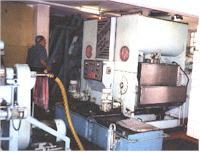 Rows of metal discs or plates are dipped into the paste. The oil preferentially wets and sticks to the metal and is removed with scrapers in a continuous process. maximize oil extraction which requires more space, labor, etc. Sale of future machines are currently outlawed in European Union due to difficulty in cleaning such large surface areas.